I use Adobe™ PhotoShop™ Elements 4 (still thinking about that upgrade to v6) to manipulate graphics (photos and other formats, too) and stuff *technical term ~cough~cough*. 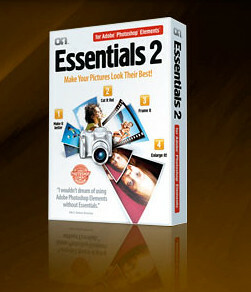 There is an enhancement package put out by onOne software called Essentials 2™. It has a couple of really nice enhancements for PSE. I use it often. Product page here. When you have a Mac you generally get automatic updates for everything. My system is set to warn me when updates are available. Since I'm a little gun shy from my days on a PC, I'll bring the updates window up and download if necessary. I got a notice for one for Essentials 2™ for version 2.0. So I clicked to download. The package download was taking too long for something that was 250 MEG. I mean over 45 minutes for something that size on a broadband connection is ridiculous. So I knew something was up, but I went ahead and started the installer anyway. Not only did it not install, but it screwed my current version of Essentials 2™ up royally. I like to think my computer mojo is pretty strong, but this threw me a loop. In desperation, I sent onOne an email via their webpage. I explained what had happened and why I thought it had happened. It took them a day or so to respond initially. After a couple of email exchanges back and forth over the period of a day. I got what I thought was a final email stating they were just going to send me a new disk with the updated package, if I would just confirm my mailing address...So I did. The next day I got an order confirmation (no charge). Later that day, I got another email informing me that the disc had shipped. This was about mid-day on Wednesday. I was getting ready to go to lunch, when I got a call on my cell from someplace I didn't recognize. Now if I get one of these on the office phone I'll let it go to voice mail. But if I get one on my cell, it means I've given the number out for some reason. So I picked up the call. It was a Service Tech from onOne Software, following up. Jeebus! This sounds like something I would have done for one of my favorite customers. She explained what I needed to do once I got the disc to get the software installed correctly. I am one mightily satisfied customer with onOne software.